Vegetarian pulled pork? Yes, you did read that right! But before I talk about this new product, I want to talk a little about low carb and vegetarians. While it may at first seem that the two dietary options don’t go together, there are plenty of people who do this quite successfully. 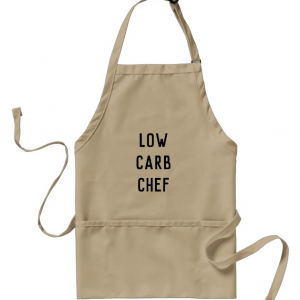 And if you’re one of them, hello, and please check out my Low Carb Vegetarian Pinterest board! Plus I know of plenty of non-vegetarians who have Meatless Mondays! So when I was offered the opportunity to try the new MorningStar Farms® Veggie Pulled Pork – I leapt at the chance with a very open mind. 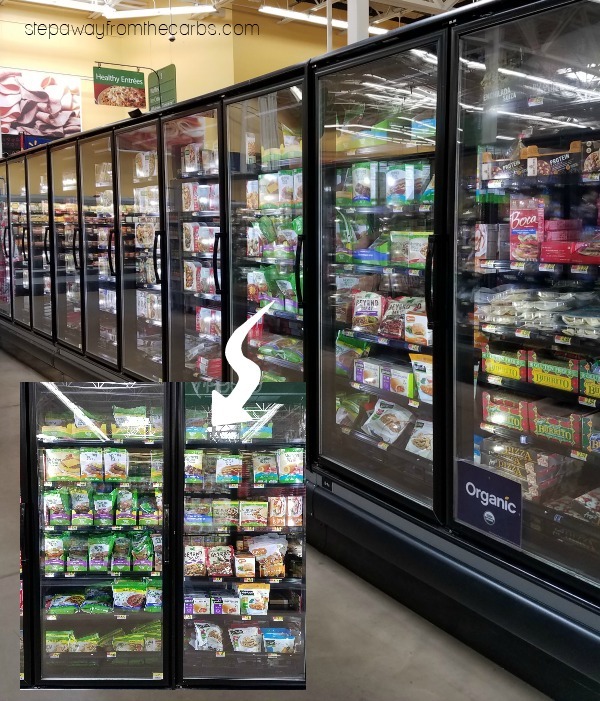 I found it in the frozen entree section of my local Walmart. If you’re wondering about the carb count of these products, be reassured that they’re low. One cup of pulled pork or one burger is only 3g net carbs. And although MorningStar Farms® is America’s number one veggie burger brand, I wanted to test them for myself. The Veggie Pulled Pork made me think of tacos. Tacos are great food for the summer, especially when you’re eating outside! The taco shells needed to be low carb, however so I used the same method as for my Shrimp Tacos. 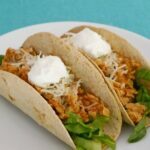 You’ll need some low carb tortillas (they’re a staple in my house! ), and some baking parchment cut to roughly the same size as the tortillas. I use the small tortillas from Mission – which are just 3g net carbs each. See my Tortilla Comparison and Review for more details! Place each tortilla on top of a piece of parchment, then hook each one over two rungs of the rack in the oven. 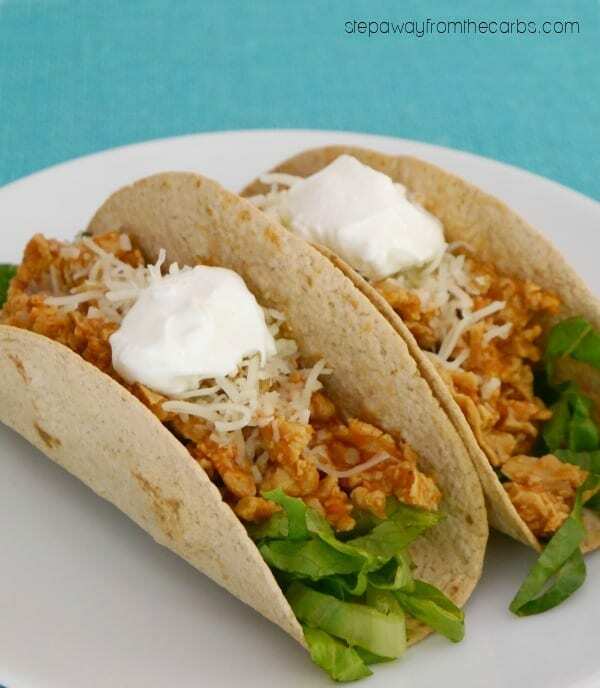 The sides of the tortilla will drop down and you’ll see an upside-down taco shell shape form. Bake in a hot oven until they go crispy – which only takes about five minutes. Although the Veggie Pulled Pork is conveniently already seasoned, I decided that I wanted to add a barbecue sauce to it. You can buy low carb versions, but I just made up a batch of my own Smoky Barbecue Sauce – which takes a little over five minutes to make. Meanwhile, I cooked the Veggie Pulled Pork in the microwave, which takes 3 – 3½ minutes. This meal was coming together so fast! I mixed the barbecue sauce into the pork, then grabbed the taco shells and all the rest of the fixings: shredded lettuce, cheese, and sour cream. Other options would be avocado slices, jalapeños, and more! Once the tacos were loaded up – it was time to eat and enjoy! Although I could tell that I wasn’t eating meat, I didn’t miss it at all! Veggie Pulled Pork is definitely NOT just for vegetarians! Vegetarian pulled pork tacos made with new MorningStar Farms® Veggie Pulled Pork. 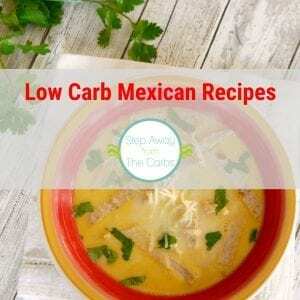 Low carb recipe. To make the tortillas into taco shells, cut some baking parchment to roughly the same size as the tortillas. Place each tortilla on top of a piece of parchment, then hook each one over two rungs of the rack in the oven. Bake in a hot oven until they go crispy - which only takes about five minutes. Cook the Veggie Pulled Pork in the microwave, according to the pack instructions. 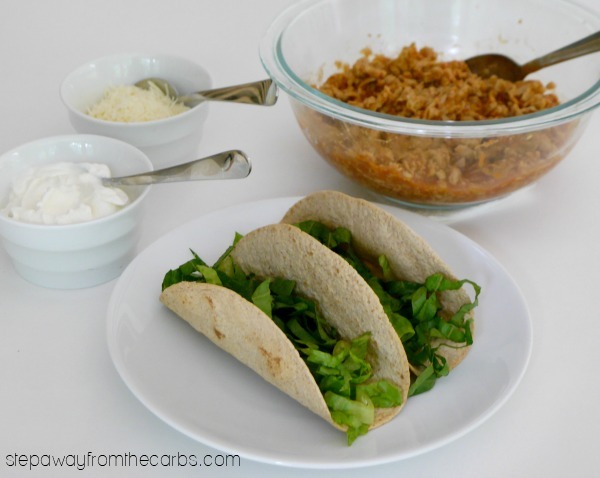 Mix the barbecue sauce into the cooked Veggie Pulled Pork, and serve, together with the taco shells and all the extras. 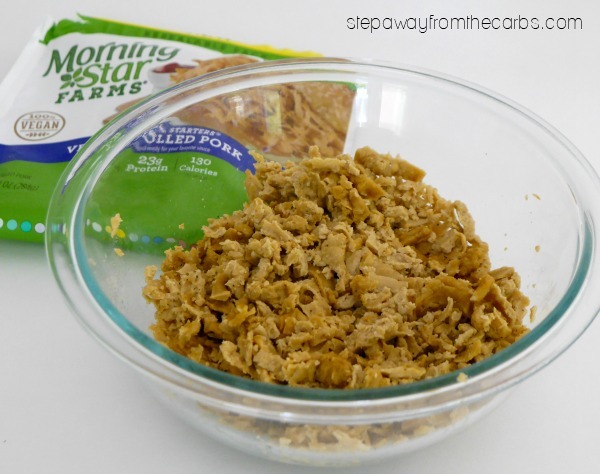 Are you ready to shop for these awesome MorningStar Farms® products? Hover over the photo below for details of where to buy them – cool, huh?